NWS forecasts are only one of many sources of forecast guidance that both expert users and the public have access to. Decision support for a spectrum of end users requires that the NWS will use social science findings and practices as a guide for making its products more accessible and effective. This lesson will focus on effective messaging when communicating weather hazards. In the process the learner will become familiar with some messaging best practices that are based on social science findings. Make the connection between social science and the National Weather Service mission. Compare and contrast the needs of expert users vs. the public. Explain the importance of communicating in the language of the customer. Describe impacts-based hazard information and relate it to decision-making. Describe and demonstrate effective messaging within NWS products and services, particularly in high risk situations. 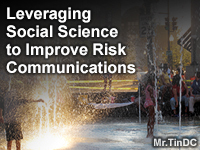 Utilize social science research in NWS operations. Assess if the affected group may be sensitized or are they inexperienced with the risk at hand. Apply effective methods for addressing forecast/warning confidence, and which aspects might be higher or lower than normal (e.g., timing versus magnitude). Craft effective messages in context of life-threatening situations that are targeted, actionable, and timely. Make use of effective wording in guidance and warnings. Apply social science concepts using lessons from past events. Describe the benefits of including a social scientist within Integrated Warning Team workshops.